On November 5, friends of mine in the Charlotte Business Guild invited me to come to their special monthly social, “Wine and Poetry: In honor of the ‘It Gets Better’ project.” I was able to read an excerpt from my chapter in “CRISIS: 40 Stories Revealing the Personal, Religious and Social Pain and Trauma of Growing up Gay in America,” edited by Mitchell Gold. Other community members also spoke, reading excerpts from other writings and poems. View other videos here. Are you living up to Christ’s two great commandments? On Feb. 25, I was honored to participate in a forum with North Carolina businessman and Faith in America founder Mitchell Gold and Faith in America executive director Brent Childers at a small gay bar/lounge here in Charlotte. Usually, politics and religion don’t go well with bars, but it was a great and attentive crowd — we couldn’t have asked for better. 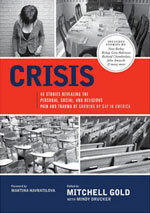 We were able discuss issues addressed in Gold’s book, “CRISIS: 40 Stories Revealing the Personal, Social, and Religious Pain and Trauma of Growing Up Gay In America,” to which both Brent and I also contributed. Before that later evening event, Mitchell Gold was a special guest of Campus Pride and local LGBT youth support group Time Out Youth at Myers Park Baptist Church. There, a little more than 100 folks turned out to hear Gold speak about his book, his experience growing up as a gay youth and issues of anti-LGBT, religion-based bigotry and prejudice. Last night I had the pleasure of taking the hour and fifteen minute drive up to Hickory. It’s a beautiful little town tucked right into the foothills of North Carolina’s Appalachian Mountains. Gold moderated a panel of three of the book’s contributors, including me, Faith in America Executive Director Brent Childers and Hickory resident Jeff Austin. Despite the heavy fog returning home — boy, did that make driving difficult for me — the night was a blast. For such a small and humble town, 100 people showing up to a gay-positive event is fabulous. Hickory’s got a lot of good things going for it. I’m glad I could be even a small part of it. Thanks to the staff of Taste Full Beans for making the night an overwhelming success! A panel discussion on the book will be held Thursday evening, Dec. 18, at Hickory’s Taste Full Beans Coffeehouse Gallery, 29 2nd Street NW in Downtown Hickory, 6 p.m. to 8 p.m.
HICKORY – Not long ago, Mitchell Gold got a note from an 80-year-old woman in Winston-Salem. She wrote that she’d never thought about homosexuality except to be judgmental. The book Gold edited and paid to publish changed that. “Crisis: 40 Stories Revealing the Personal, Social and Religious Pain and Trauma of Growing Up Gay in America” features pieces contributed by names readers will recognize, such as Barney Frank and Martina Navratilova. Far more common are stories from everyday people including writers, editors, ministers, students, doctors and others. Most suffered a crisis, a “black cloud,” Gold calls it in his own story, not because they were homosexual, but because of the fear their world — families, friends, the people they loved — would reject them because of it.